Bring a new level of aesthetic and functionality to your home by installing an end vent slider window. These windows combine a wide view with a horizontal sliding function, as they are made from a fixed center window and sliding windows on both sides. Due to this simple and smart design, you get to enjoy an unobstructed view and a breeze of fresh air. An end vent slider window is a great alternative to a double slider window. Despite having a largely fixed structure they are easy to clean, as the operational sashes can tilt into your home. Where Should I Install End Vent Windows? End vent slider windows can be manufactured in larger sizes than standard sliding windows, which is why they are common for living rooms and bedroom. They are perfect for brightening dark spaces and providing excellent ventilation while being easy to clean. With the rising popularity of walkout basements, end vent window demand is growing as well. How to Clean End Vent Windows? As mentioned above, end vent windows are easy to clean. To extract the sash unlock the window and squeeze the tilting mechanism together, then pull the sash towards you. Simply spray a glass cleaner on one pane at the time and wipe dry. Place the sash back and push on it until it latches in place. When you are finished, close the window and engage locks. 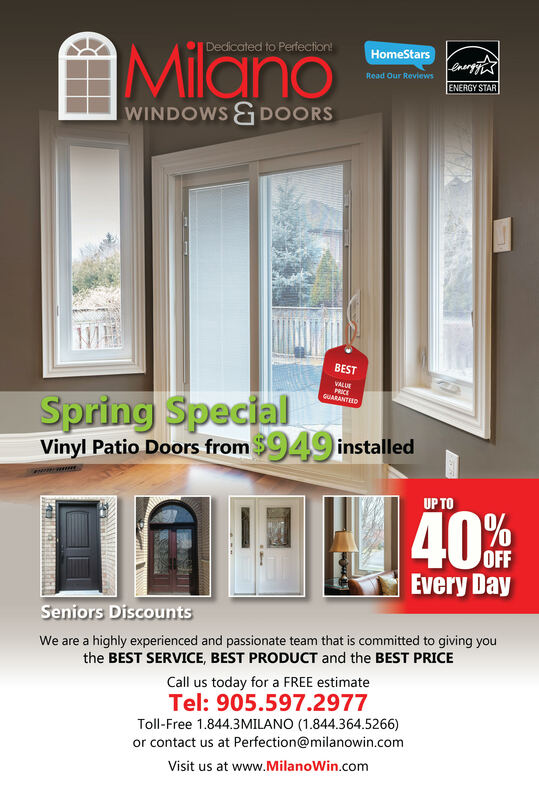 Choose Milano Windows and Doors Inc.
Milano Windows and Doors is a GTA based company that serves all of Toronto, Vaughan, Richmond Hill, Maple, Newmarket, Mississauga, Brampton and beyond. Our company specializes in window and door installation. With hundreds of satisfied customers all over the GTA, we can guarantee that you will not be disappointed with our services. Give us a call today for your free consultation.